← Only to be there. When I was at Clarion, I had what I thought was a marvelous idea for a story. I found Neil Gaiman on chat, who was our instructor that week (and a marvelously generous one), and said, “So a bunch of scientists go see the first true dolphin play ever performed for humans. They all burst back out of the theater, screaming and weeping, and it’s a big mystery to everyone.” He said, “That sounds great! But you have to show what happens in the play.” It took me about ten seconds to get over the idea that I would not, in fact, have to show what happens in the play; that it would somehow be better if I didn’t. And then began the more difficult work of trying to describe what Alien Art would look like. 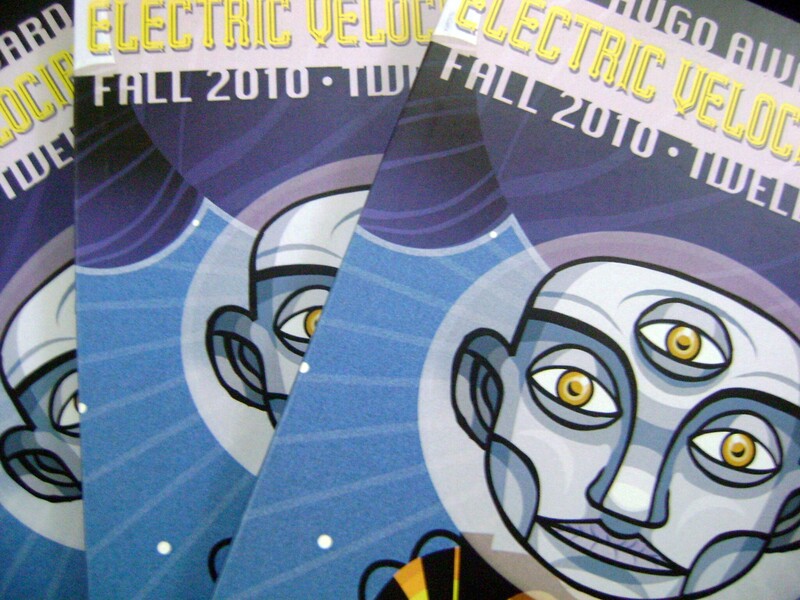 The story became “The Comedy at Kualoa.” It’s finally in printed form in the (belated) Fall 2010 issue of Electric Velocipede. What makes it even better is that I share this issue with two of my wickedly talented Clarion classmates, Keffy Kehrli and Damien Walter. I see some delicious summer reading ahead. Thank you Nicole! It IS. I will never get sick of seeing my byline. Return to Monica's main site.